Who knew there was a sequel to Snow White (Hollywood can't stop, won't stop). Right off the bat, it's significantly better than its predecessor in large part due to the fact that KStew isn't in it. And in no way does this movie deserve a confounding 16% on Rotten Tomatoes, because despite its role reversal this pop-corn flick remains the fairest of them all. Cedric Nicolas-Troyan, who was actually the visual effects supervisor for Snow White, stepped up to direct The Huntsman: Winter's War. This movie has magic, it has castles and it has a handful of fantastical creatures, all of which will wildly entertain the kiddies and teens. The female component of the cast is nothing if not accomplished. 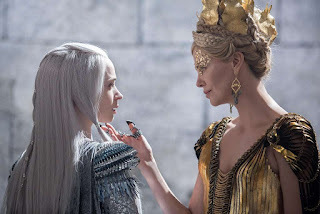 Evil queen Ravenna (Charlize Theron) and the huntsman (Chris Hemsworth) return for round two, joined by the fierce huntswoman (Jessica Chastain) and the beautiful ice queen sister (Emily Blunt - love). 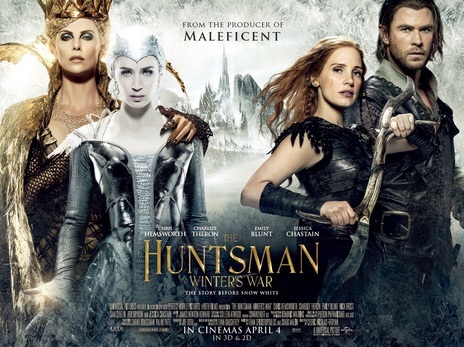 The gist of the plot: As a war between rival queen sisters Ravenna and Freya (Blunt) escalates, Eric (Hemsworth) and fellow warrior Sara (Chastain), members of the Huntsmen army raised to protect Freya, try to conceal their forbidden love as they combat Ravenna's wicked intentions. While I found Winter's War to be few sades above average, I maintain the story was unreasonably confusing - jumping back and forth between being a prequel and a sequel. It's also predictable, mixed with underdeveloped story-lines/characters, all sprinkled with a rushed, anticlimactic ending. But with that said, many elements of a terrific Fantasy are still in full swing. It shines with stunning visuals, dazzling costumes and striking set-designs. Stellar! Stellar! Stellar! And the plot, despite its lack of development, is surprisingly original. There is also a lot more humor this time around, which is refreshing. The movie doesn’t take itself too seriously, which in the end makes it an easy, fun and enjoyable movie to watch.